This travel item isn’t even that superfluous. Actually, I think it’s a bit of a necessity. So I strongly suggest you hop into your car, head to the local Target or Wal-Mart or Costco or whatever, and pick up at least one, or possibly two, food bloggers. They will prove indispensable on your next trip. Just be sure to get the awesome, willing-to-eat-almost-anything variety, and not the stuck-up, won’t-touch-it-if-it-isn’t-certified-organic kind. What’s that you say? Your local mega-mart doesn’t carry food bloggers in stock? That is indeed a tragedy. I suggest you get online and try to find one that way. And no, you can’t have mine. But I don’t blame you for trying. Because holy crap, is she awesome. I met the effervescent Gastrognome on New Year’s Eve, at my friend (and fellow blogger) Rachel‘s house. When I found out she would be in San Diego for the same conference that Rand was attending, which was en route to Rachel’s wedding in New Orleans, which we were all attending, I was thrilled. We were going to be more than internet friends! Hooray! And, holy cats, the Gastrognome did not disappoint in the friendship department. For a goody-goody like me, she’s a great foil – the girl who makes you try new things, like mooning cars or calling up the boy you like before immediately hanging up. Only, you know, with food. 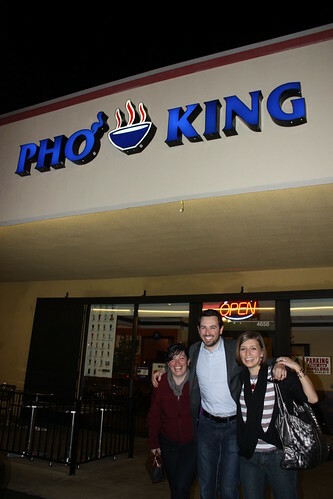 She went with us to Pho King, a trip which we had arranged months ago, after she found out that the hole-in-the-wall in San Diego had stolen her future restaurant name (I understand entirely. If someone ever starts a bakery called “Much Ado About Frosting”, heads will roll). And, rather than be creeped out by the somewhat sticky tables and weird guy roaming around the parking lot with his belly exposed, she was totally at ease with everything: picking through the menu, ordering appetizers for the table, sampling unusual soft drinks, and testing the heat of each of the three hot sauces at the table. No snobbery. No elitism. No “I-know-more-than-you-so-do-as-I-say” attitude. The adorable Gastrognome and my almost-equally-adorable husband: immediately prior to the impromptu jalapeno-eating contest that took place at our table. In short? A great person with whom to share a meal, or even a trip. 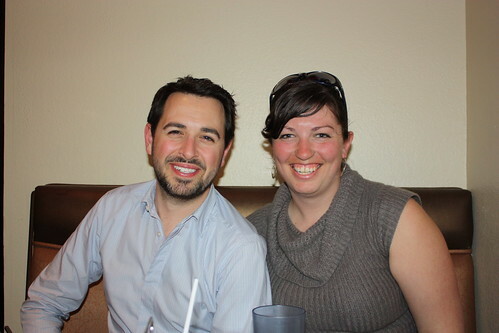 A scandalously short time later, we went out again to eat (what? Don’t judge me. Pre-meal meals are awesome), and as we shared a plate of oysters, she once again showed her chops, explaining what each of the oysters were, the accompaniments, and telling me tales of a place in New Orleans with 25 cent oysters. Fairy tales for foodies. Like I said before, you absolutely must find yourself a food blogger. And once again, no – you can’t have mine. But, holy crap, is she awesome.